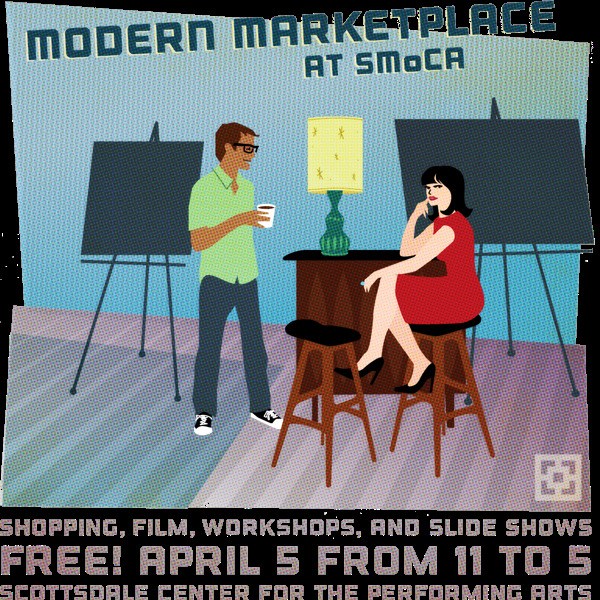 New York City has their fashion Week, Miami has Art Deco Weekend, and this weekend kicked off the 10th Annual Modern Week here in Phoenix! 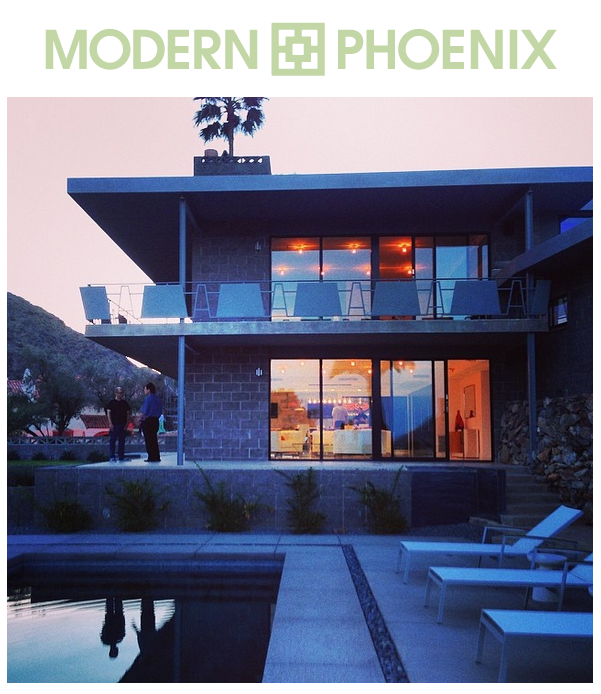 Modern Phoenix Week is a week long celebration of the historic & iconic mid century modern architecture here in the Valley. Saturday afternoon kicked-off MoPho Week this year with a tour of the iconic Hotel Valley Ho, directed by hotel concierge Ace Bailey. Jeff and I attended the tour and LOVED it! A second tour will be happening this coming Saturday morning, at 10am. (I'll be going more in depth about our tour experience in the upcoming next post.) Sunday was a slide presentation and talk by Roger Brevoort at the Shemer Art Center about preserving Arcadia's fragile Mid Century architectural character. Monday thru Friday will be full of evening events, some including an architectural film at SMoCA, a mixer at DWR Scottsdale, and a First Friday gallery artist reception at the vintage shop, Modern Manor. Read more about the Monday - Tuesday - Wednesday Mixers! 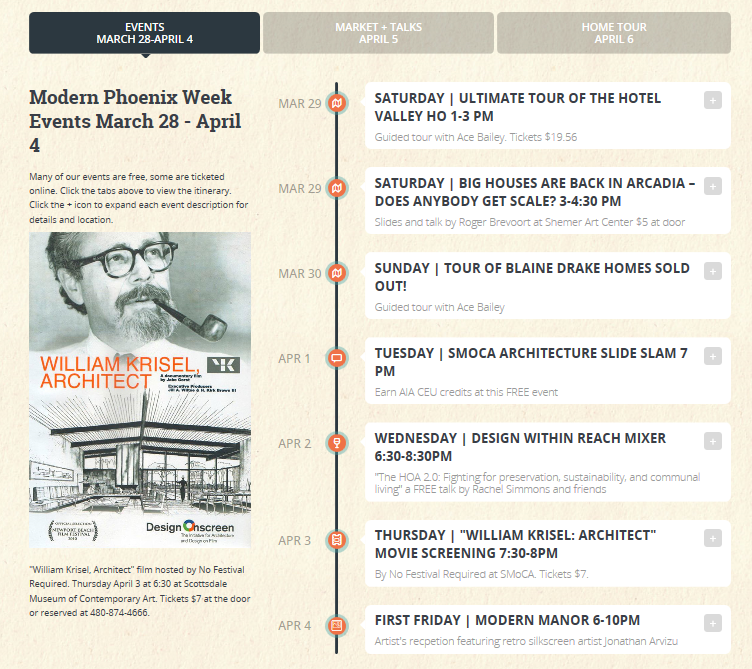 Besides these events, also be sure to check out a wonderful source for mid century architecture here in Phoenix at: MondernPhoenix.net plus follow their facebook page, twitter, and instagram too. Stay tuned for my Valley Ho Tour post! Traditionally, during the Ming Dynasty a thousand years ago, the great homes of China were designed and built around a courtyard, with emphasis on a zen garden. Naturally, benches and stools became an essential design element for the function of this outdoor space. It's been said garden stools most likely were the result of the Buddhist tradition of using tree stumps and smooth rocks for seats in the garden. 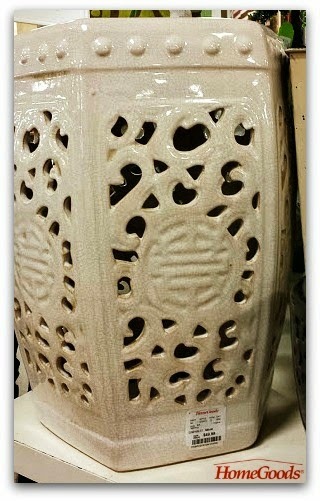 Early garden stools were made from wood, stone, glazed stoneware or porcelain. 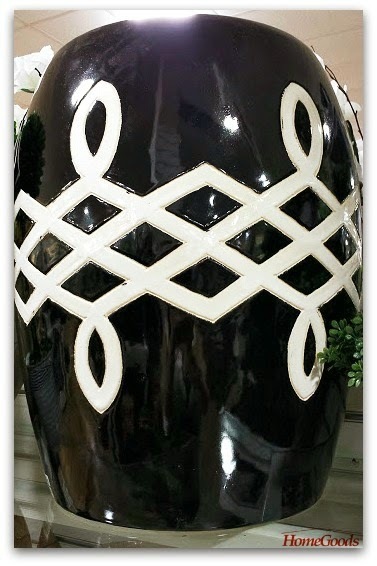 Soon they began to feature decorative elements, such as nailheads (also known as bosses), Asian linked coin motif (believed to bring good luck) and pierced carvings such as lattice and even smaller filigree. 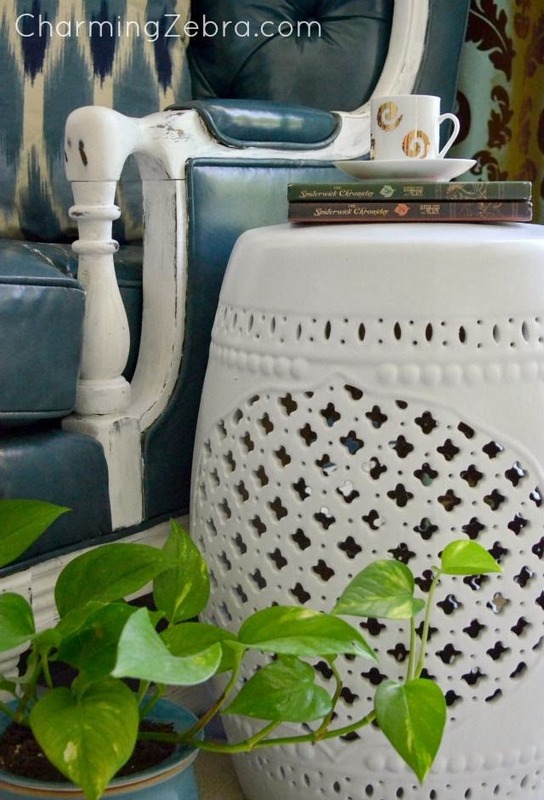 It wasn’t until the mid-20th century that the garden stool was embraced in the West. 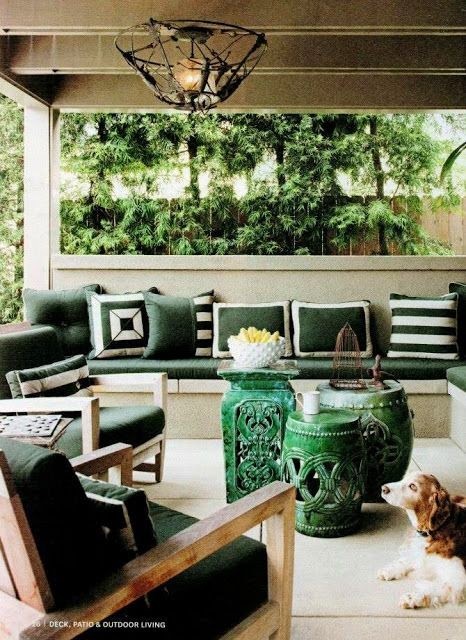 A pair of garden stools can help show off a great pattern rug vs. a traditional rectangular coffee table, which would cover it up. 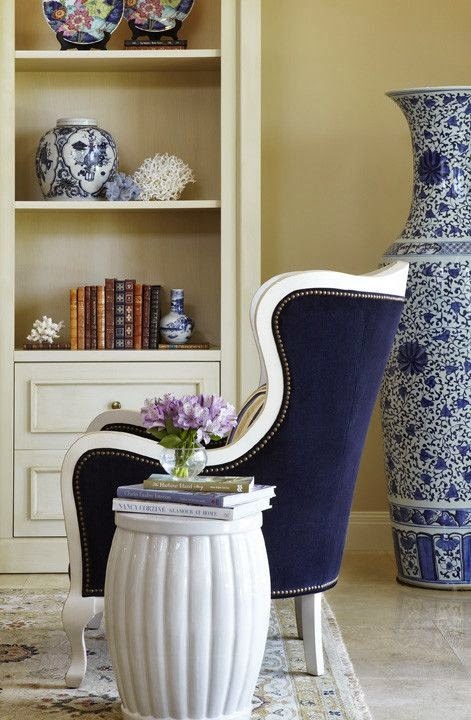 As a side table for books and fresh flowers in the living room. 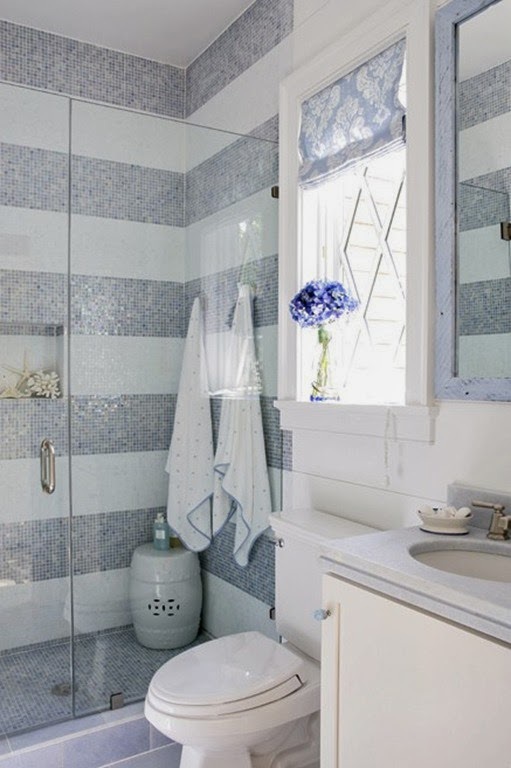 As a resting place for your towel near the tub. As a ledge in a shower enclosure. As vanity seating in the bedroom. 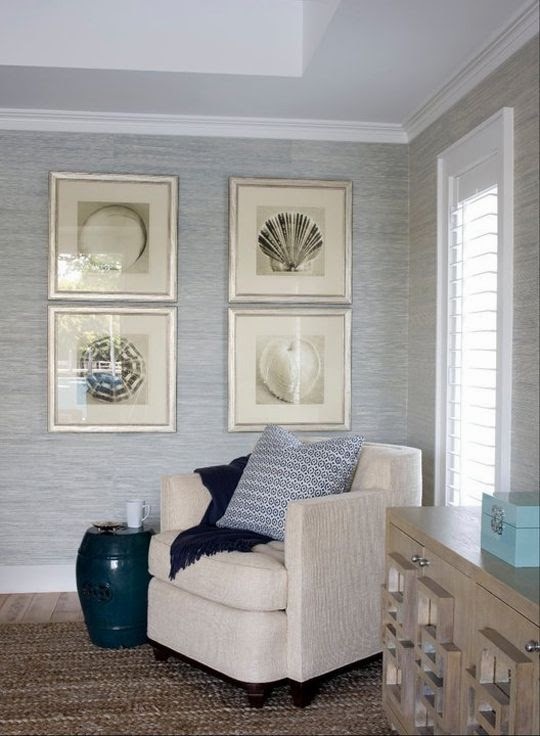 As a side table for guest room corner seating. 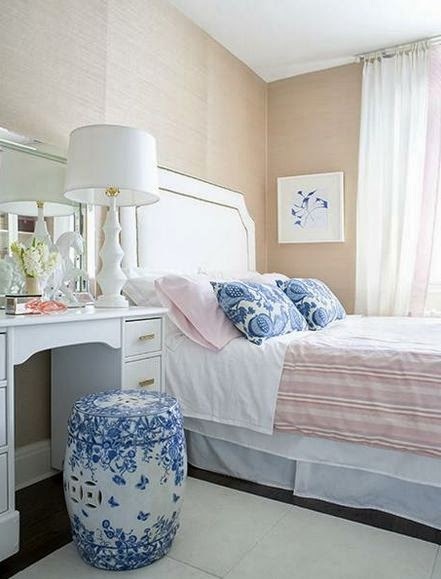 As a layered extra side table + pattern in a bedroom. 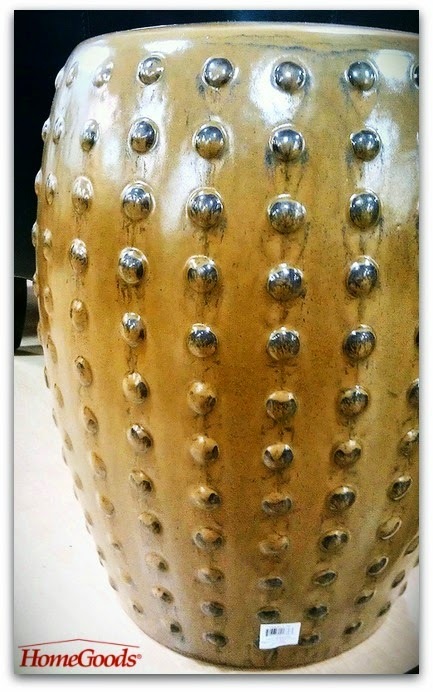 As a pair for a coffee table in a small space. 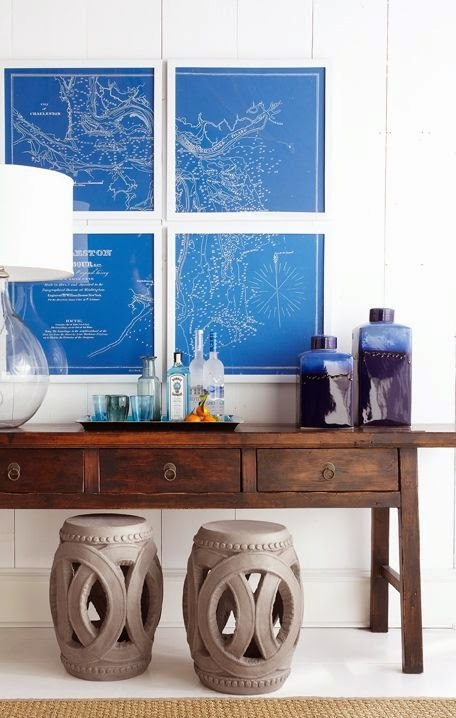 As a trio of color under a console table. 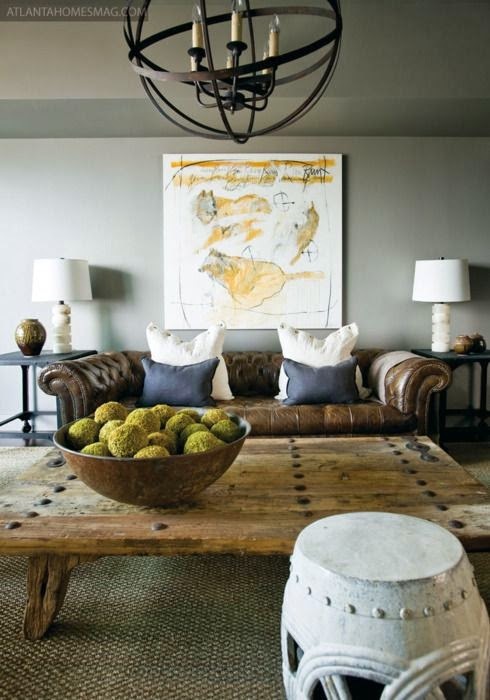 As layered character in a room. As a side table for books and tea. 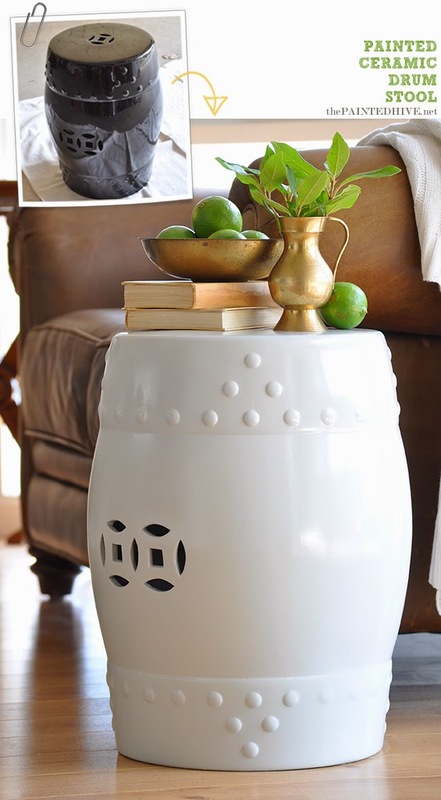 As added texture under an entry table. 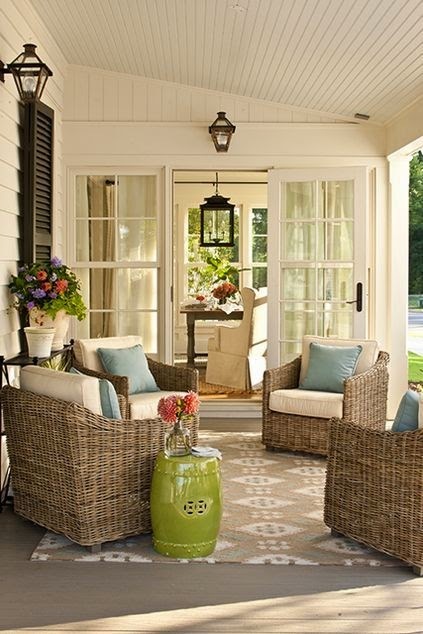 As a side table on a porch. Color-blocked in a cluster on the patio. 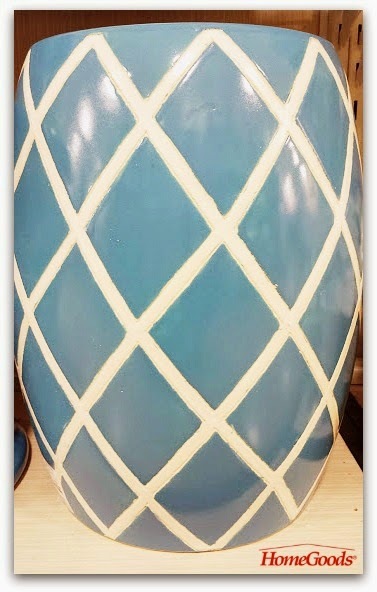 If you do come across a good price and size of a garden stool, but it's not quite the right color, or maybe you want to refresh one you already have, it is possible to paint your garden stool, with this simple process featured at The Painted Hive - How to Paint Ceramic - Drum Stool Redo. 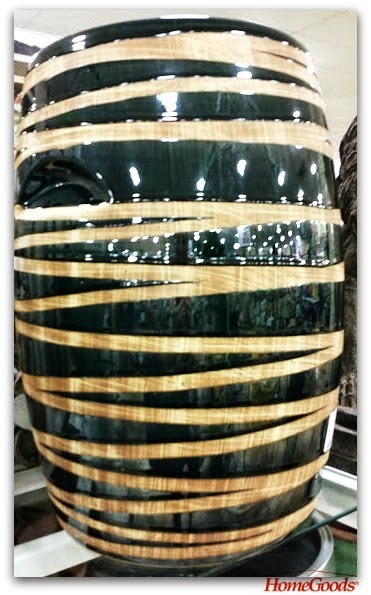 Earlier this year, when I went to the Las Vegas Market, Safavieh launched a new Garden Stool Program (snippet seen below). Garden seat decorations vary. 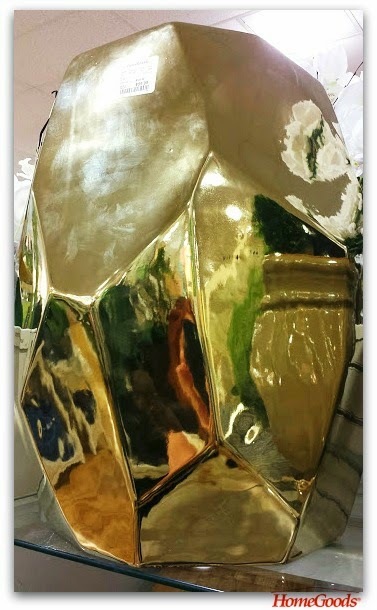 You can read more about the Chinese garden stool origin, symbolism, and mythology, by visiting HomeDecoDirect and also be sure to see the selection I spotted at my nearby HomeGoods in my previous post: Stylish Garden Stools For Spring At HomeGoods. 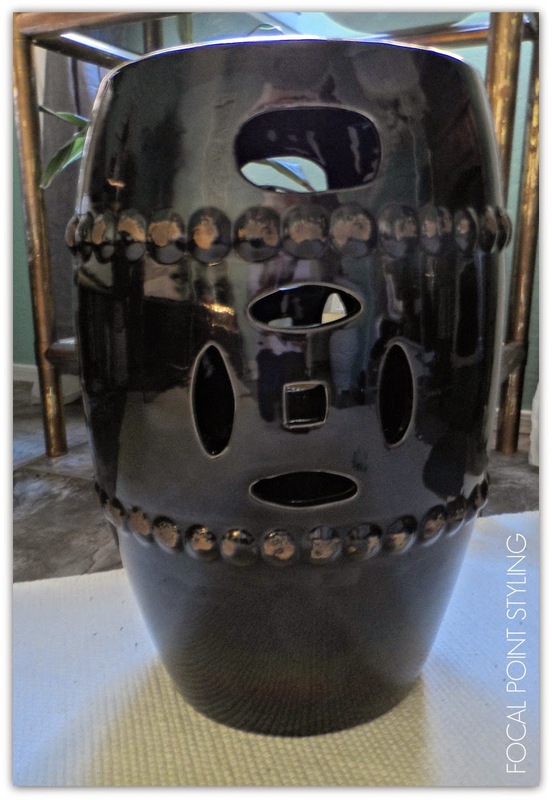 Do you have any garden stools in your home? Where do you use them at? 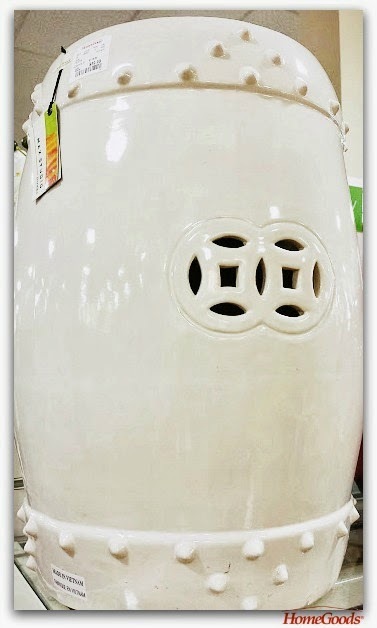 This black & white garden stool was probably my fave! 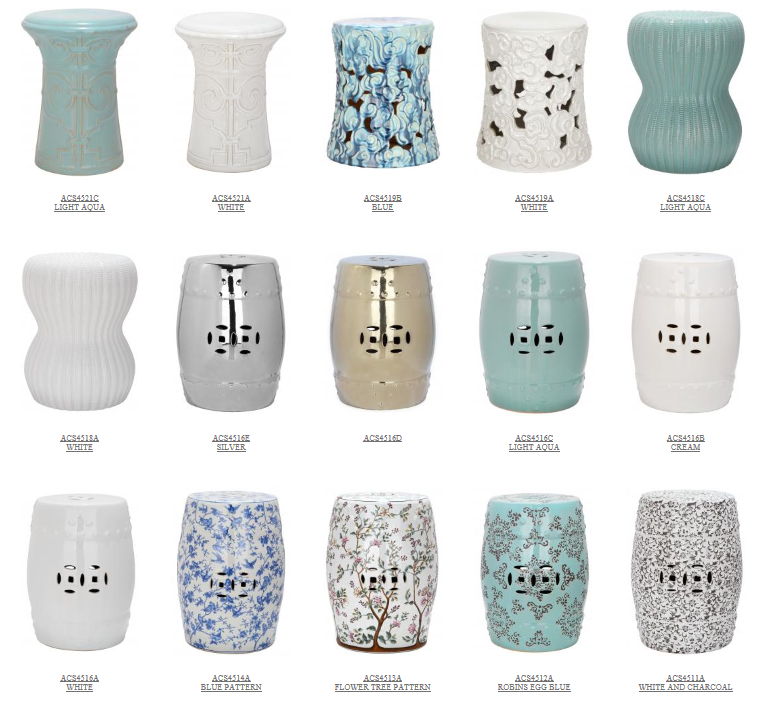 These garden stools were all only $49 and $69 each. 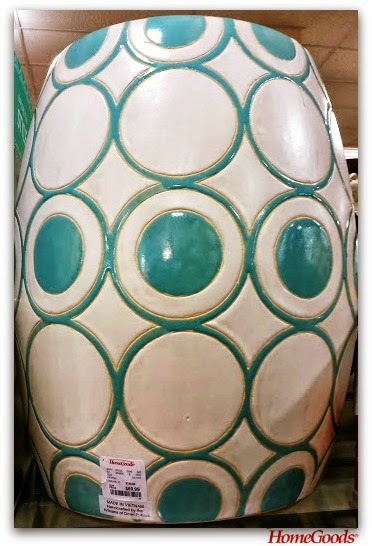 HomeGoods receives new shipments every week, so there's always something new to discover. I lucked out and found this black one for only $29! 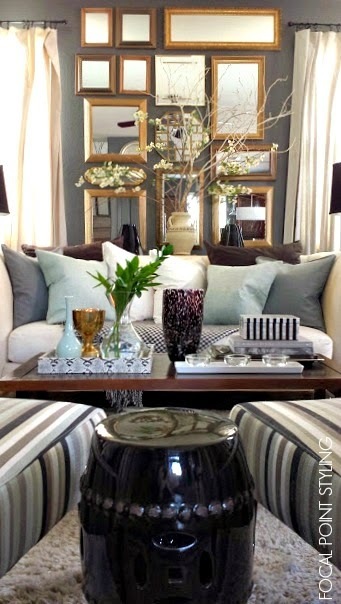 I transitioned our living room from all black & white to having accents with hints of mint for Spring. The black garden stool works great paired with the stripe slipper chairs I now brought up from downstairs, and it will also work with with future seasonal changes. Today is the First day of Spring, along with some exciting trade show happenings! 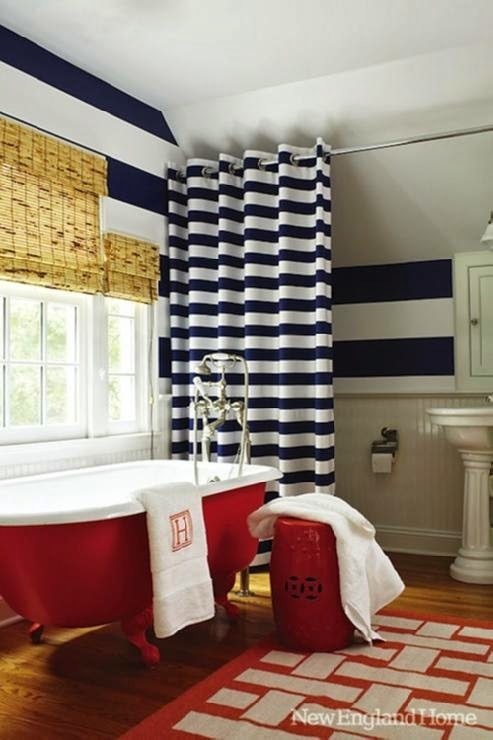 NYC is kicking off Spring with the 13th Annual Architectural Digest Home Design Show, happening March 20 - 23 at Pier 94. 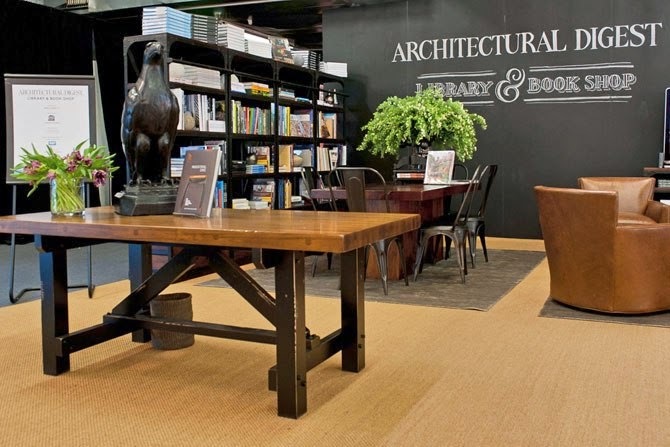 Also known as the AD Home Design Show, the event will host 300+ exhibitors PLUS design seminars, cooking demonstrations, book signings, cocktail receptions, along with brand and product launches + debuts. One of the debut's at the AD Home Design Show will be a pop-up shop concept called ‘The Shops’ – an on location retail experience with products available for immediate purchase. The new cash & carry market features The Shop at Cooper-Hewitt, DwellStudio, AllModern (a division of Wayfair), and more. Even if you are unable to attend the event, thanks to social media, you can follow along on Twitter using the hashtag #ADHDS2014. New York Times Designer Seminar Series Panelists - including NY Designer, Patrick J. Hamilton. One of the featured seminars will be the Jenn-Air Master Class Studio, featuring exclusive programs including trade seminars organized by Architectural Digest, a keynote presentation by Editor-in-Chief Margaret Russell, and a three-day New York Times Designer Seminar Series. 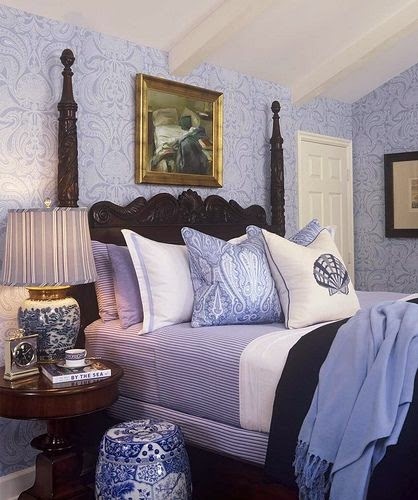 I wish I was able to attend, if only to see & hear my friend, Interior Designer Patrick J. Hamilton speak as a panel member for “Design Dot Com: The Changing State of the Industry,” on Saturday afternoon. Patrick is also one of the several talented designers participating in the Design on A Dime Event, coming up later this Spring in April. More about DOAD coming up shortly, but be sure to check out Patrick's vignette contribution on my previous post: Charity Causes Get Vignette Set, plus read Patrick's blog at AskPatrick. 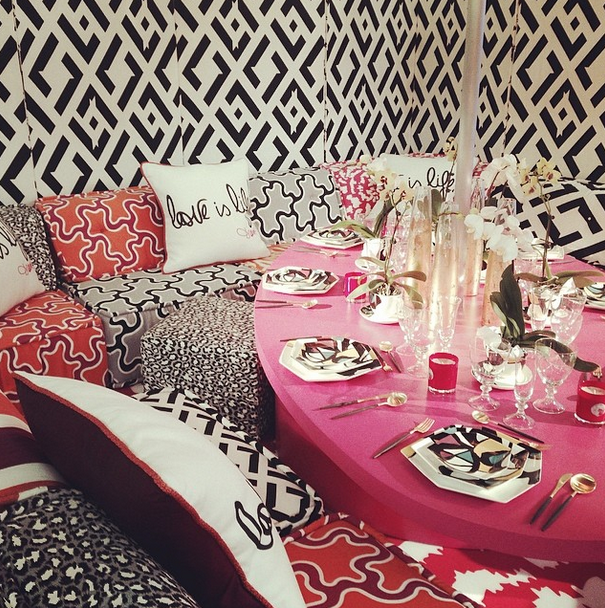 The DIFFA - Dining By Design Event will kick-off this evening, Thursday, March 20, with a Cocktails by Design Preview Party from 7 - 10 pm and a Gala Dinner will take place Monday evening from 6:30 - 11 pm. If you are unable to attend these evening soirees, you'll still be able to view the magic tablescapes and dining environments Friday, March 21thru Saturday, March 22 from 11am—7pm and Sunday, March 23 from 10am—6pm. 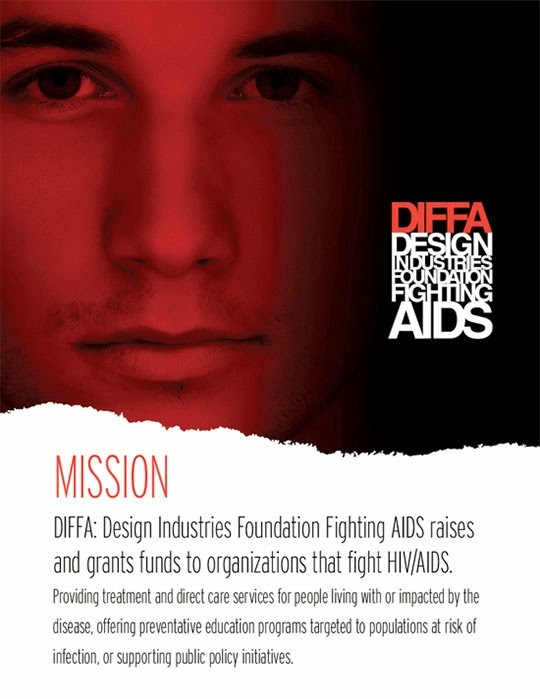 For tickets to attend any of the DIFFA events, visit: diffa.org. 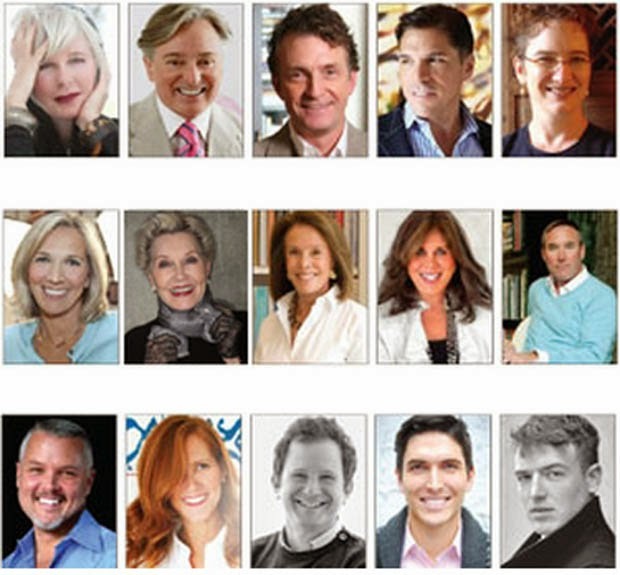 Besides following the AD Home Design show on twitter at #ADHDS2014, you can also follow at #DIFFA -- AND -- #BlogTourNYC. 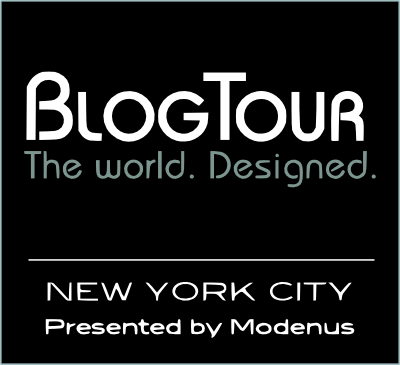 Meet the bloggers of Blog Tour NYC 2014 on Modenus. It's an exciting time to be a part of the City that never sleeps! 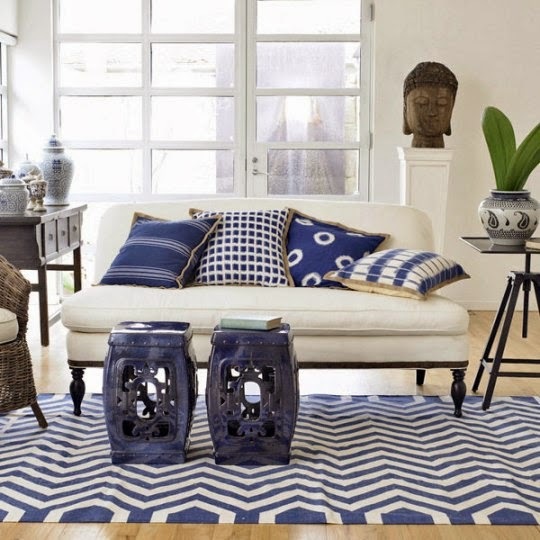 With all these wonderful design events happening to kick-off Spring, how could you? So you dove into a closet cleanse and you're ready to clear the clutter? While donating all those garments is wonderful, another means of clearing your closet clutter can be to consign. Consignment is a way for you to turn the clothing and accessories you no longer wear into funds for something new. Consignment can help moms extend kids clothing budgets: Sell the gently used clothing kids grow out of so fast, into dollars to buy clothing for the following season or that they can grow into (See Resale Shopping for Kids at SheKnows.com). Consigning clothing can also be a great money saving system of rebuilding your wardrobe for a lifestyle change, especially if you've moved to a new climate or location - or you're just a simple fashionista! 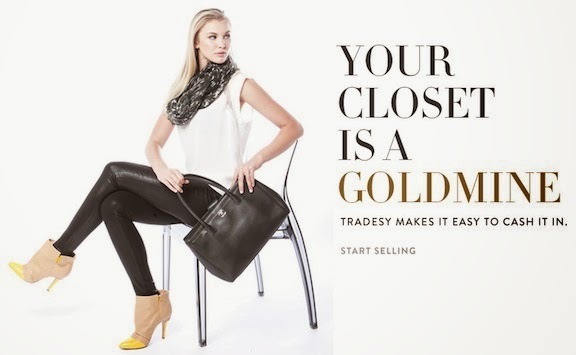 "Everything SOLD is new again" -at Tradesy. 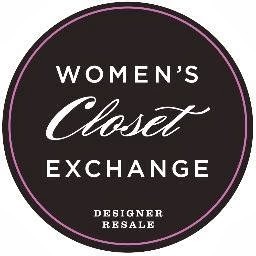 You might recognize The Women's Exchange from the popular TV show, ReSale Royalty, which is located in St. Louis, MO, but also has an excellent assortment of designer goods online, for a fraction of the cost of buying them retail. A great means of adding a little splurge while you save and purge. For additional consignment shops and locations, do a search in Google for (your area) Consignment Shops, plus also visit The High Low, which offers not only a list and links to 5 Online Consignment Shops, but also calls out a few others in the comment section as well. 2 - If not dry cleaned pressed or ironed, sometimes a quick spritz & light dryer time can remove wrinkles (especially for knits) just be sure to hang immediately after cycle complete. 3 - If you have pets, a quick pass with a sticky lint roller can help to remove pet hairs - even if item is already cleaned. 4 - Hang clean & wrinkle free consignment clothes vs using a bag drop off: Your items will not only look their best, but you'll be able to keep track of how many items the shop takes to consign. Some items will need to be bagged (such as shoes or accessories) which the blue Ikea Tote is great for. 5 - Clean and polish shoes, boots & bags, especially if these items have been lingering in your closet, they may have collected some dust. If it's a tote or purse you've grown tired of, but it's still in good condition: check all pockets, clip any stray strings, and shake out any bottom dwellers. Be sure to include the bags dust bag (if it came with). GooGone helps to quickly polish bags, boots and shoes - works especially well on patent finishes. 6 - Check your local or online consignment shop site for a list of brands they do & don't accept. Typically, consignment shops are looking for gently used to new items, from the past year, up to 4 - 5 years. The exception would be authentic vintage or retro items. 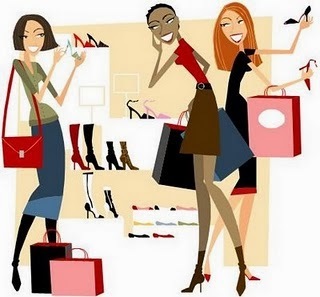 Besides clothing, fashion items can also include: purses, wallets, travel bags, better costume + fine jewelry, sunglasses, shoes, vintage bags + jewelry, hats, and scarves. Good to know: Some consignment shops will also take that perfume you spritzed once and didn't care for, or had a reaction to. Again, just check site or call to verify. 7 - Check consignment site to see if an appointment is necessary plus what the item limit is. Some may be split: 25 item walk-ins Monday - Friday, while weekends may require an appointment. 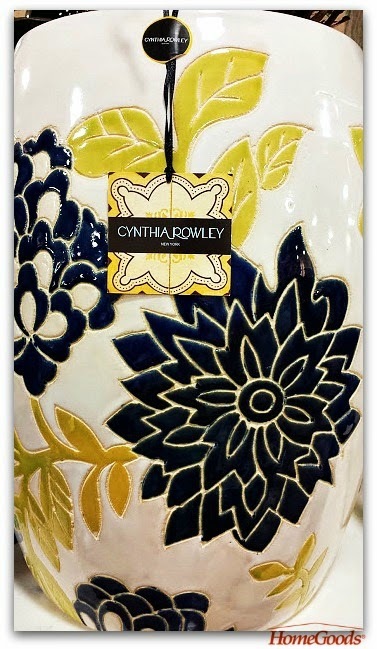 9 - If you're selling clothes online, take photos showing what makes your item unique. If there is visible wear or damage, be sure to photograph it. Remember, online today is all about being transparent plus building a good online reputation. 10 - Whatever doesn't consign, donate to your local Goodwill, Salvation Army, or church thrift shop. For extra thrifty savings, drop off donations to Savers Thrift, and receive a $3 off your next purchase coupon. Across the pond, a charity organization to donate to can also be cashinthecloset. Your listing is 100% free, you can sell as many items as you'd like plus you can set your own prices. 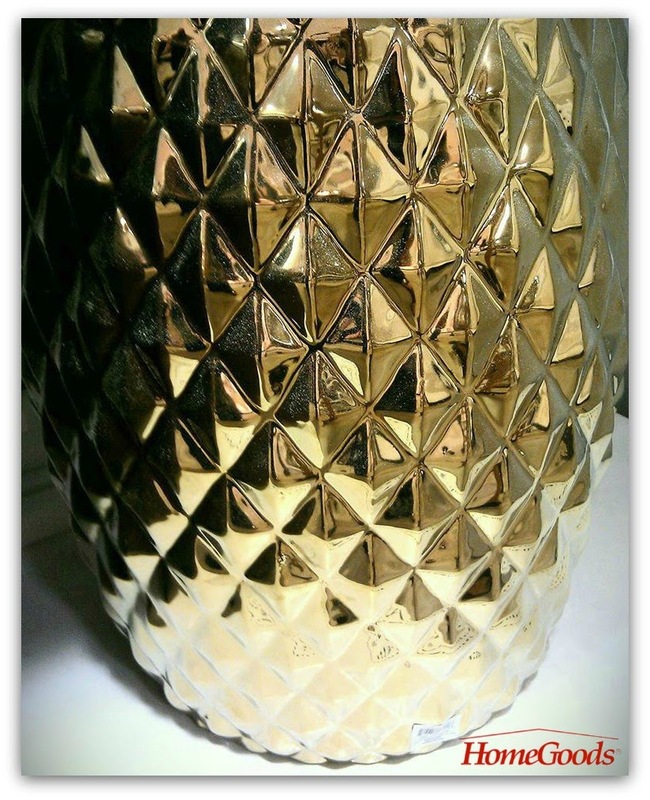 Your listing will remains active until the item sells. 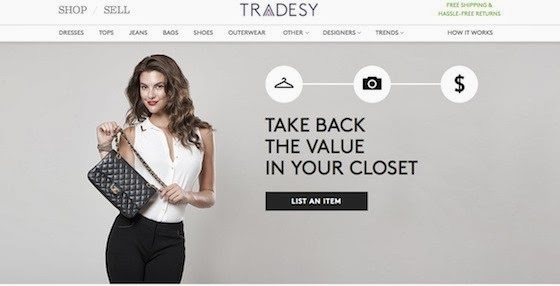 See Tradesy: How it Works. 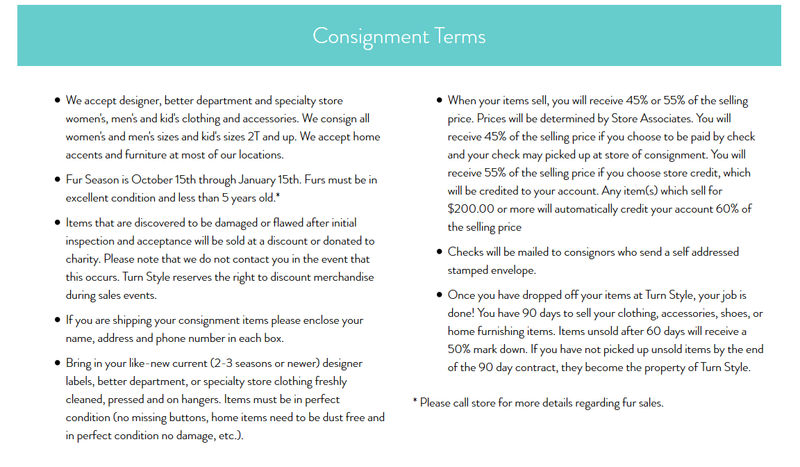 One example of Consignment Terms - From TurnStyle. Some consignment establishments will offer you 45% of the selling price (if you want to receive a check) and 55% as a shop credit to use towards your new purchases. Remember though, consignment shops aren't selling items at retail prices - they are usually priced 60% to 70% less than retail. Granted, consignment isn't going to necessarily turn your bank account into a Trump account, but if you're looking for a budget friendly wardrobe solution - other than thrift - consignment is it! 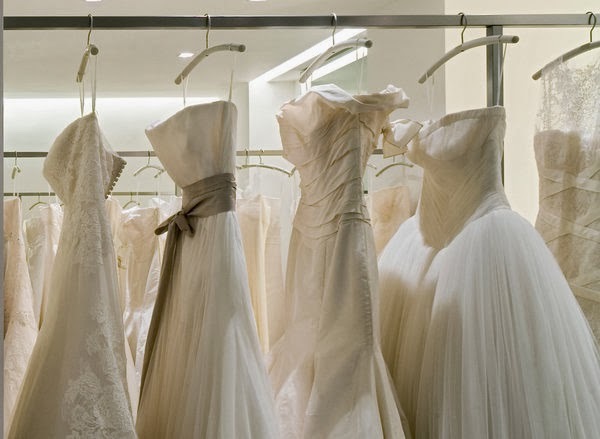 For additional tips about how to consign, see this article at Lucky: Consigning your Clothes: What you Need to Know. 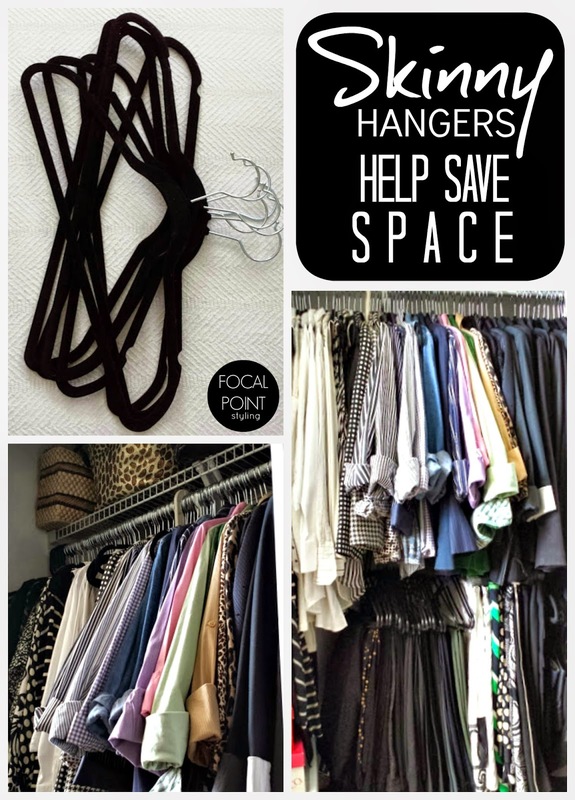 And don't forget - Skinny hangers help save space! 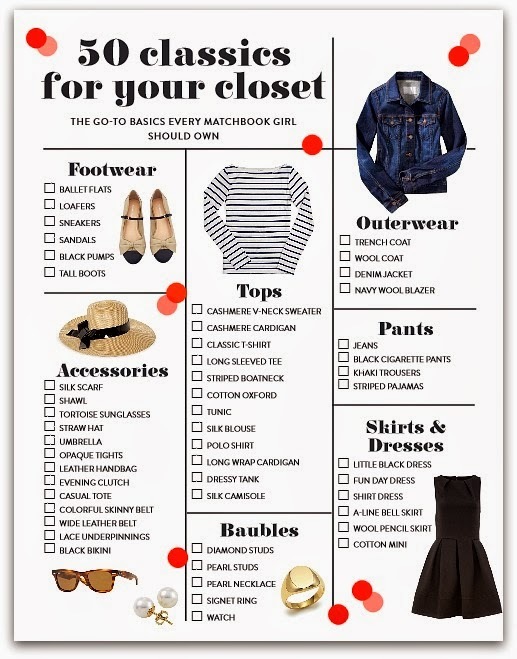 Happy Spring Cleaning and Closet purging!